Every office has that guy or gal who drops names all the time. Don't be that person. CLICK HERE to access a video I made about the subject. Pass it on to everyone you know; especially the name droppers in your life. Maybe after watching the video they will have a change of heart and try other means for career advancement like pretending to have the same interests as the boss or taking credit for projects they contributed little to. Either of these options would be less annoying than name dropping. I catch myself doing it sometimes and it’s not healthy. There are better ways to get ahead. I have REALLY appreciated the comments and suggestions on what new topics to cover in future videos. Because of you (dear internet people), I have plenty of ideas for making fun of the white collar world. Please keep the ideas coming. In the mean time, enjoy this week’s video on name dropping and don’t forget to subscribe to my YouTube channel and forward this link to your coworkers and friends. CLICK HERE for my video from last week called Post-Nominal Letters, in case you missed it. 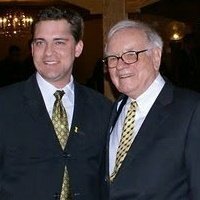 Did I mention I know Warren Buffett?